Disk Wipe is a portable data destruction program for Windows that can obliterate all data on any hard drive using one of several data wipe methods. This how-to wizard is used to walk you through the wipe process to make it super simple to erase a hard drive. How Does Disk Wipe Work? Disk Wipe is completely portable, which means you don't need to install it to use it. After running the program, every internal and external hard drive will be listed, including flash drives. However, because Disk Wipe runs from inside the operating system, as opposed to from a disc (like with DBAN and ErAce), it can't be used to erase the drive that Windows is installed to. Some options are customizable from the settings, such as choosing a default volume label for newly formatted drives. 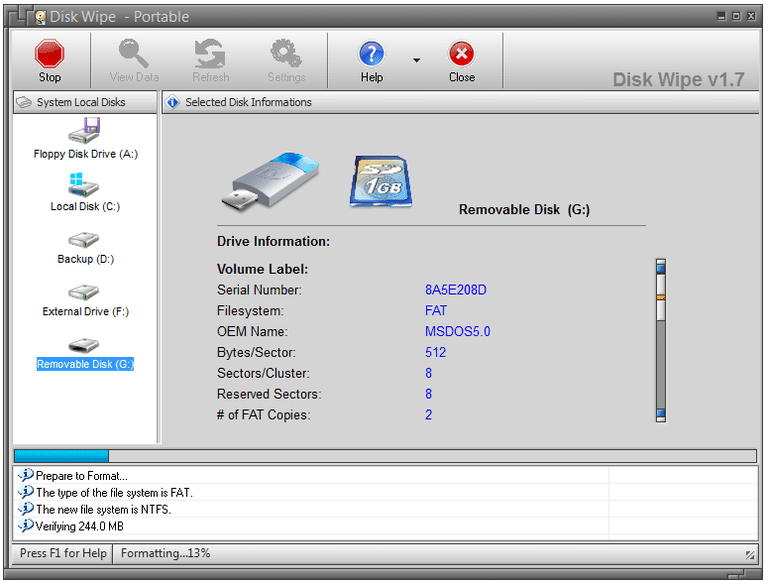 To use Disk Wipe, choose any hard drive and click Wipe Disk to start the wizard. Choose a file system the drive should be formatted as, then select a data sanitization method. Type "ERASE ALL" to confirm that you really want to erase the drive, confirm it once more by clicking Yes, and then click the Finish button to start. How Effective Is Disk Wipe? Disk Wipe looks to be more complicated than some similar data destruction programs at first glance but it's actually very simple to use. If you follow the process listed above, only a few steps with a couple of options are required to start erasing a whole drive. Overall, Disk Wipe is a solid program for destroying all the data on a hard drive. It's easy to use, provides several data sanitization options, and doesn't even need to be installed.